I can’t recall ever seeing him when he wasn’t smiling. He was always happy and his joy for life rubbed off on other people that had the privilege of being around him. His sudden death this week has shaken me to my core and reminded me yet again just how important every day is in this remarkable life on earth. It’s a harsh wake up call, yet I see it as a challenge to be a better person and to bring more joy into the world, every day. 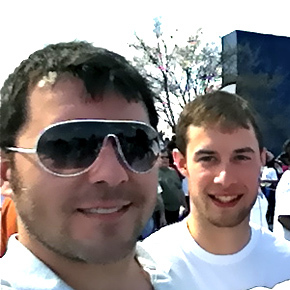 3 weeks ago, I sent Jeremy a text message to ask him if he was going to join my Hunger Walk/Run team again this year. He was the only person that had been there every year since I started forming walk teams, but he had not signed up yet. That particular week was tough for him – he was extremely busy at work and said he had no time to take on anything else. I understood and went about my day. A few minutes later, I got an email notification that he had joined the team. I smiled and thanked him for making the effort, despite clearly having a lot of other things on his mind. He ended up raising $200 that will be used to bring joy into the lives of those who struggle with hunger every day. People that would have gone without food will eat because he stepped up and answered the call to help others while doing something he loved to do in the process. A few days later, we met at the starting line for the run, chatted for a few minutes, and off we went. He was a much faster runner, and he took off quickly, leaving me behind. It was the last time I saw my friend alive. At the risk of this post sounding like a eulogy, I feel compelled to share this story. For myself, and for you. By sharing this, I get to honor my fallen friend, and hopefully you get the sense of the impact we can each have on others in our world. Every day, I aspire to be a joyous, positive person and bring happiness to those around me. Sometimes it comes easily, but I have yet to get to the level of joy that Jeremy seemed to embody so effortlessly. I would prefer not to have to lose a friend to spark a change in my behavior. This is the second friend I’ve lost in the last 6 months, and my heart truly aches for not only my loss, but the loss to the world. Losing Jeremy reminds me that every single one of us has the opportunity to either spread joy through the things we think, say, and do, or to spread negative energy and fear through these same thoughts and behaviors. Simply smiling at people changes the world. Saying thank you changes the world. Answering the call to serve others changes the world. Everyone can be a beacon of light and happiness for others to see just a easily as we can gripe and fret over all the things we perceive as wrong in our lives. We each have within us the ability to spread joy in this world. Jeremy chose to. Will you? The Hunger Walk/Run fundraising campaign is open through March 31 – if this post speaks to you, would you consider making a donation to Jeremy’s page?